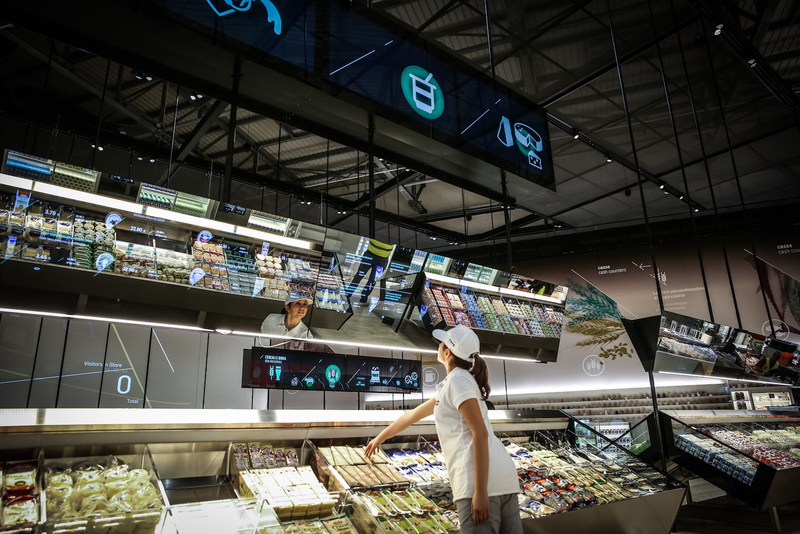 Digital information including provenance, nutritional value and preparation advice is layered into digital screens in Carlo Ratti x Coop Italia's Supermarket of the Future. The future of retail is up for grabs and with Amazon’s recent acquisition of Whole Foods and Blue Apron’s underwhelming IPO, it seems like the fight for consumer food dollars will be a solid bellweather for what our retail experiences will look like in the near future. To get an understanding of how companies plan to deliver foods and services to consumers, we take a look at five emerging supermarket concepts from around the globe. Instead of going to the grocery store, why not have the grocery store come to you? 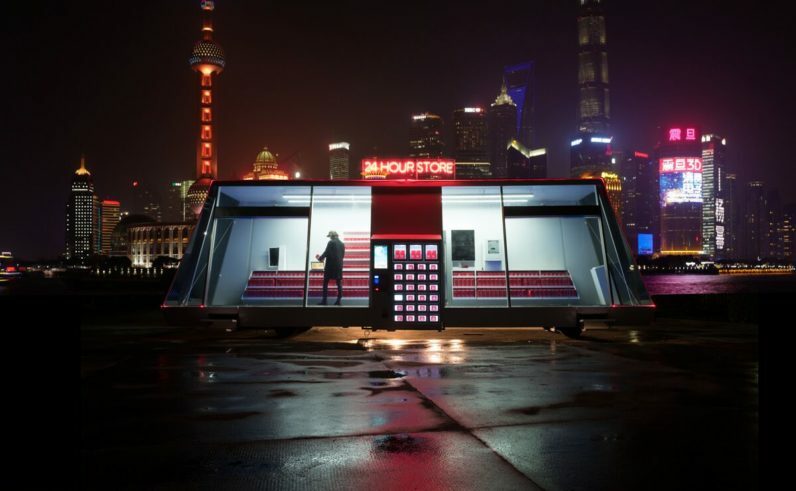 In Shanghai, a startup is beta-testing a mobile, solar-powered, self-driving, 24-hour convenience store that leverages AI to predict and provide consumers the products they want. Downloading an app, consumers use their phone to both call the Moby store and use their phone to access the space. A hologram greets returning customers and smart baskets track purchases, automatically charging your card when you leave the store. 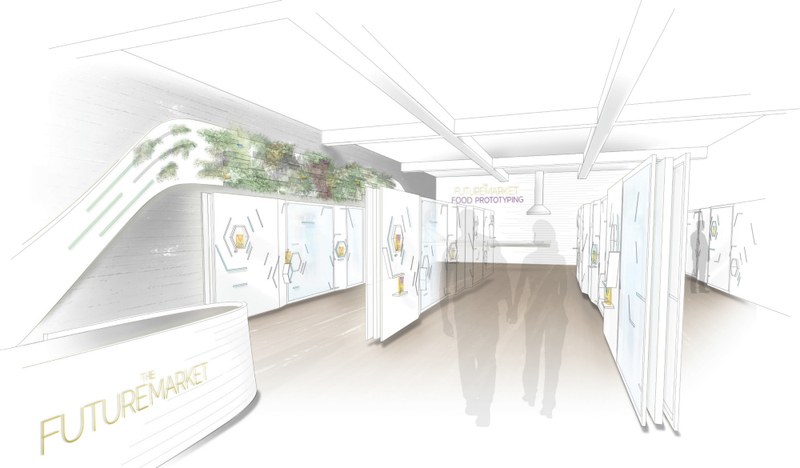 The concept could transform the shopping experience in dense urban areas by providing customized shopping experiences without the considerable overhead of renting a storefront and staffing it. The concept comes from Wheelys, a Swedish company that is developing Moby in conjunction with China’s Hefei University. The announcement of Amazon’s purchase of Whole Foods was cause for industry-wide speculation, but the online retail giant has been tinkering in the supermarket space for years. 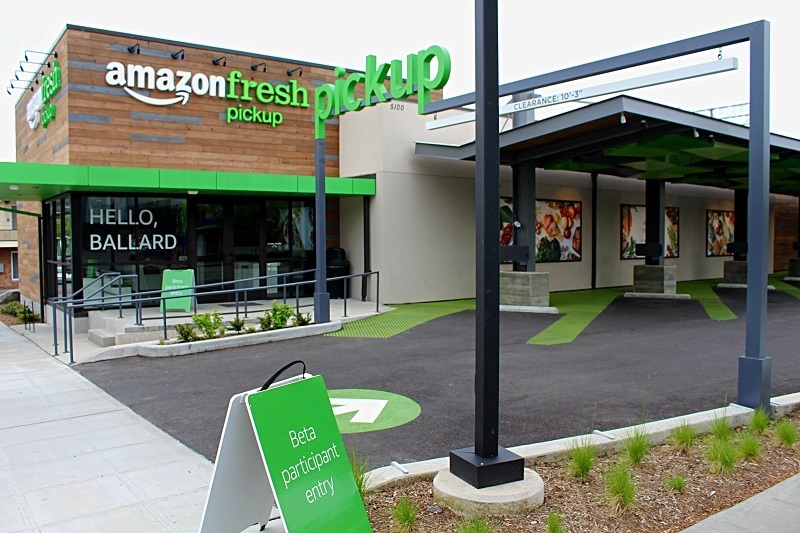 In March, their AmazonFresh Pickup concept debuted to the public with two drive-through grocery points in Seattle. Customers order products online, reserve a time and instead of delivering bags to you at home, an AmazonFresh Pickup rep will deliver bags to the back of your car. The service is free for Prime members and can be placed and picked up with a 15 minute lead time. With Amazon Go, the checkout-less retail concept introduced in December, customers download the Amazon Go app, use it to access the 1800 square foot store, take what they want off the shelves and walk out. The concept has been under development for four years and is currently only available to Amazon employees in their Seattle location. Their “Just Walk Out” technology uses face recognition technology, algorithms that read the probability for our purchases and camera sensors. For a deep dive around the technology, read this great breakdown from Haomiao Huang on Ars Technica. 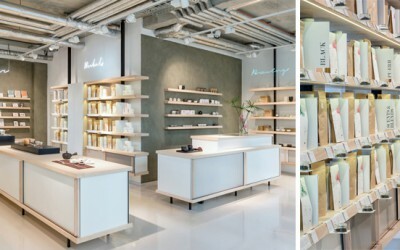 Debuting during Expo Milan 2015, Coop Italia, Italy’s largest grocer, teamed up with MIT Senseable City Lab lead Carlo Ratti to present a concept for connecting with digital natives in a physical retail environment. 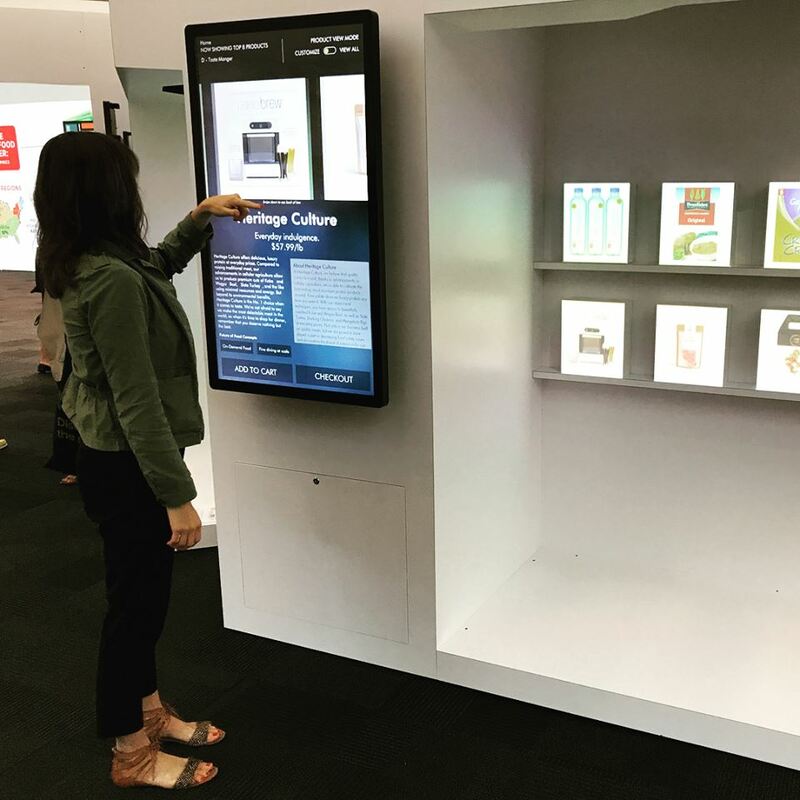 Reimagining everything from signage to product presentation, the concept added layers of digital information that could be accessed with simple gestures or through a mobile app. Vertical shelving was redesigned to reflect the digital shopping experience with associated products stocked nearby. 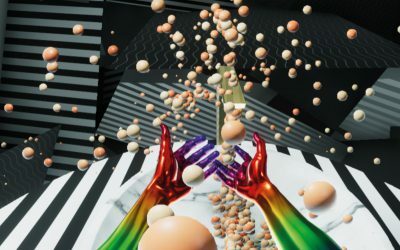 Through augmented reality, shoppers could find out point of origin for produce, learn more about waste disposal, find promotions and access suggestions for corollary products. 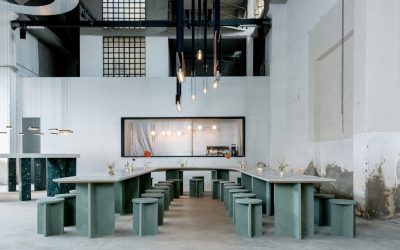 In December 2016, Coop Italia’s Future Store opened for business in Milan, taking learnings from the concept and translating it into a real world shopping experience. Combining an “atmosphere of local open-air markets with innovative digital solutions,” and includes hallmarks of the Expo Milan concept including interactive tables and real-time data screens that provide in-depth product information and augmented labelling on the product itself. 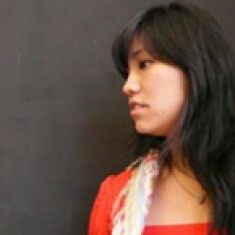 Separating the shopping experience from grocery fulfillment, the Future Market’s digital shopping system takes cues from food delivery services like Amazon Fresh and Fresh Direct and leverages an algorithm that both records and analyzes food preferences based on user input and biometrics so that product choices in the digital market are tailored to each customer. Think Netflix recommendations based not only on what you watched before but your unique body chemistry. The accompanying exhibit showcases 22 concept food products that the Labs would want to see on grocery shelves in 25 years which include Crop Crisps (using grains that are rotated every year on a four year cycle), Heritage Culture (a brand harnessing the power of cellular agriculture for protein) and Custom Culture (precision microbiome yogurt). 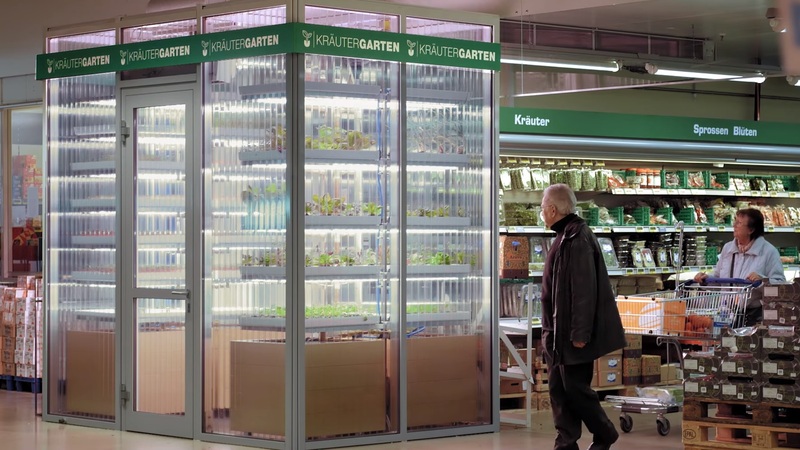 After launching the world’s first in-store “farm” with METRO Berlin supermarket in 2015, the startup Infarm is flush with a new round of investment and plans to expand their offering with EDEKA, Germany’s largest supermarket chain. The modular systems are designed with cloud-connected sensors that monitor the health and readiness of the produce. 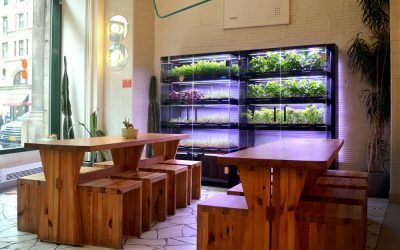 Additionally, the vertical construction rotates plants on growing trays from the center to the perimeter according to their size to enable a “perpetual daily harvest.” Since launching, Infarm has sold about 400 packages of herbs a month.